Our G-7 economists expect little uptick in today’s US inflation, which could weigh back on US Treasuries. The benchmark 10Y bond is now yielding about 2.53%, a little down on yesterday’s 2.55%, not helped by very disappointing factory gate prices from the US. The lack of overlap between these two series is one reason not to despair of a potentially higher figure, but we suspect our guys are right. This is not yet the time. But that may be about to change, as our Chief International Economist, James Knightley writes today in a comprehensive look at inflation. Even so, with a weaker USD and higher energy prices likely to account for a good chunk of any rise, and core inflation increases likely to be more subdued, we doubt this is going to deliver more than a gentle nudge higher to longer-dated Treasury yields. The trend may be for these to rise, but this could be a very slow burner. A more exciting bond story is potentially unfurling in the Eurozone. Grab a look at the equivalent 10Y Bund yield in Germany, up to 0.57-0.58 this morning, after minutes from the ECB indicated that they could change their forward guidance early this year. While US Treasuries have at least priced in a decent chunk of Fed tightening this year, European bonds have all the unwinding of QE to go and have nothing priced into the shorter end of policy rates. For a more misaligned market relative to our medium-term policy projections, you would have to travel a long way from the Eurozone to find a competitor. This sheer scale of the potential unwind of ECB policy measures is only hinted at in recent market movements, but will take place in both bond and FX space. Our FX forecast for EUR by end of this year is EUR/USD 1.30, our 4Q18 bond yield forecast at only 0.75% looks a little low in comparison, though the direction is right. Indeed, one of the stronger arguments for higher US Treasury yields is stronger European government bond yields. Most forecasters start from the other direction, but this is one of those occasions where the tail wags the dog, not the other way round. Many traditional buyers of Eurozone government bonds look to have been displaced by ultra-low yields – an assertion backed up by European portfolio outflows. The ultimate destination of this displaced investment is unclear, but a combination of US Treasuries, EM bonds, high yield debt seem likely. 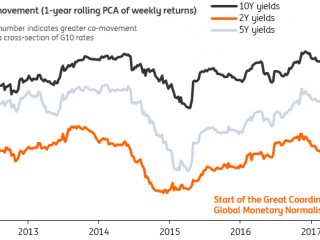 As Eurozone bond yields normalize, these errant flows are likely to return. In the process, yields in these other debt products should rise, though more modestly. It’s a relatively quiet day in Asia. We have already had Japanese current account data, which showed a smaller than expected surplus (adjusted November figure JPY1700.gbn vs consensus JPY2168bn). A weaker trade balance on stronger imports seems to have done some of the damage (though consistent with stronger domestic demand) along with a dip in primary incomes. China also releases trade data today (for December), and it too is likely to show some moderation from last month, though mainly because the November export figures were so strong (12.3%YoY in November). Put this down to a statistical payback rather than anything more meaningful. Retail sales in Singapore will also remain subdued, with an annual growth rate of only about 1%, indicating that the household sector is still in early recovery mode, and not much more. And finally, Indian CPI should rise again this month, along with stronger industrial production data. We don’t see either having any impact on the RBI’s neutral policy stance. The CPI rise is mostly a food price effect which should wear off, and overall growth, despite some better production data today remains sluggish.